I know I just posted zucchini cake but I still had 3 zucchini’s left so I decided to make a chocolate zucchini cake version. This is another one of those recipes you’re grandma likely made for you at least once. 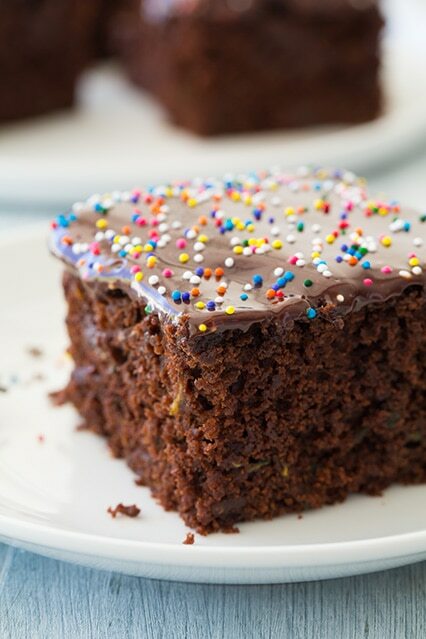 It is richly chocolaty and deliciously moist thanks to the generous amount of zucchini in it. Yes you can use your zucchini to make a zucchini casserole or zucchini cakes but I say why not turn it into a dessert instead? 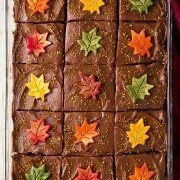 I baked this in a 13 by 9-inch pan but you could also make it into a layer cake and cupcakes should work too (you may need more chocolate ganache though – at least for the layer cake). 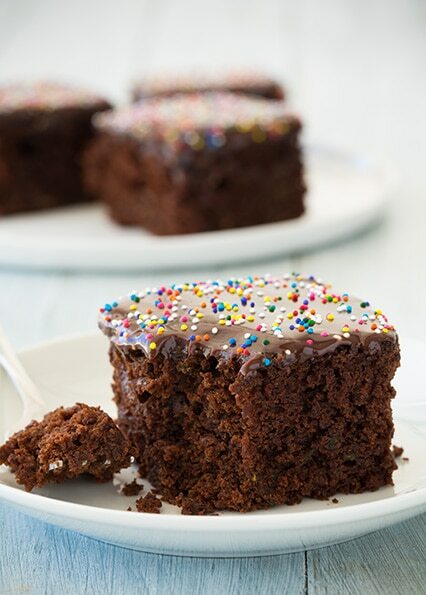 You could also swap out the chocolate ganache with a chocolate buttercream or chocolate fudge frosting, any of them would be delicious choices. 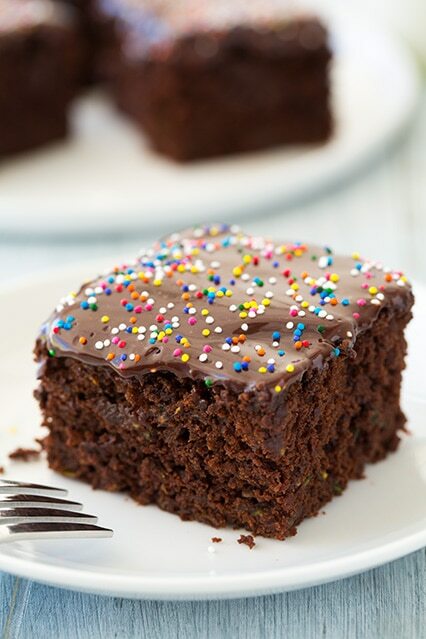 Life needs chocolate, so go make some chocolate cake, and enjoy! 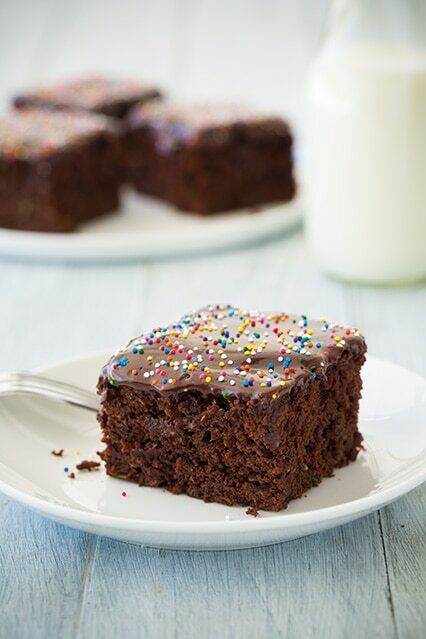 A rich and tempting chocolate cake with hidden pieces of zucchini that add the perfect moisture to the cake. Preheat oven to 350 degrees. In a mixing bowl, whisk together flour, cocoa powder, baking soda, salt and cinnamon for 30 seconds, set aside. In the bowl of an electric stand mixer, fit with the paddle attachment, whip together granulated sugar, brown sugar, butter and applesauce on medium speed until pale and fluffy. Stir in eggs one at a time, mixing until combined after each addition. Stir in vanilla. Working in 3 separate batches add 1/3 of the flour mixture alternating with half of the buttermilk beginning and ending with flour mixture and mixing just until combined after each addition. Fold in zucchini. 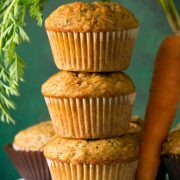 Pour mixture into a buttered 13 by 9-inch baking dish and bake in preheated oven 43 - 46 minutes, until toothpick inserted into center comes out clean or with a few moist crumbs. Allow to cool almost completely then frost with chocolate ganache. Heat cream in a small saucepan (or alternately you can microwave in a microwave safe dish) and bring just to a gentle boil. Meanwhile place chocolate in a heat proof mixing bowl. Pour hot cream over chocolate and whisk mixture until smooth. Allow to cool 5 minutes before spreading over cake. 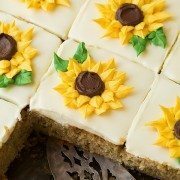 Amy @ swiss miss in the kitchen: I was looking for a zucchini cake recipe (I have so much zucchini from our garden!!) and I think I found the perfect one!!! Your cake looks amazing Jaclyn! Many thanks for sharing!! Patty McGuire: Jaclyn, This cake recipe is DIVINE!!!!!!!! I’m having a piece of it now with my lunch. YUMMY!!! Can’t wait to try some more of your recipes. Very good cake, indeed.